1960 Cased Spectrometer / Camera System, Unused. This is a most unusual offering. 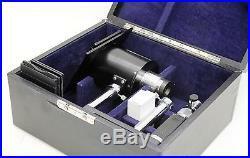 It is a very complete and unused Atago spectroscope with plate camera and pillar stand in a fitted case. The heart of the instrument is the’field spectroscope’ portion, which is very compact and light weight. Using a high-dispersion Amici prism the view is direct. The viewing side of the instrument has a large chrome collar which attaches to the included camera housing and supports the spectrometer (the pillar stand in turn supports the camera, which is significantly larger). The rectangular housing include a couple of controls for imaging the spectral scale (backlit – bright lines and numbers superimposed upon the projected spectrum). The smaller button on the side allows one to critically focus the scale. A coaxial pair of knobs controls the position of the projected scale upon the spectrum by shifting a small right-angle prism. The center knob controls the position of the prism and the larger knob locks the prism in position. The H-beta’F’ line is indicated on the scale for precision setting with an appropriate spectral source (486.1 nm). On the’source’ side of the box is a chrome tube with a number of adjustments. Starting nearest the box is a wide knurled ring used to focus the spectrum. Just beyond the ring is a bracket with a mirror which is used to illuminate a split field for comparison measurements. The narrow knurled ring just beyond the bracket controls the width of the slit (continuously adjustable, which determines the sensitivity of the instrument). The slit does not entirely shut but comes close. The end-most knurled ring swings in the prism that enables comparison spectra. When the prism is swung aside, the height of the spectral lines doubles for standard viewing. The’reference’ source is then additionally projected through a small aperture next to the mirror, and samples may be placed either directly in front of the larger main aperture or into small vials which may be placed within the cutout provided. These vials are not included with this instrument. The diameter of these bores is 6.00 mm. Also included in the cabinet is a rather elegant miniature plate camera system. The support for the camera is cast iron with a large chrome tube and clamp screw. The camera itself has a pin that fits the tube along with an adjustable stop ring so the height of the instrument can be repeatably set. The spectrometer is attached to a ring on one side of the camera. The plate holder is angled for proper focusing of the spectrum. The camera includes a ground glass viewing screen along with a custom double-sided 6 x 9 cm glass plate holder. The dark slides for the holder have to be removed in order to fit the holder into the storage cabinet (otherwise the lid will not shut). The camera plate carrier has a vertical slide with three detent positions so three spectra may be recorded on a single plate. The shutter is a simple guillotine operated by the lever on the front of the camera housing. Lastly, there is a small lamphouse that is used to illuminate the reference scale. The lamp socket is provided with spade leads, but no power supply is included. The lamphouse clamps onto the short tube near the scale focus button. It carries the Technical Instrument name along with the serial number, 18512. There are no documents of any kind included. The spectrometer is in flawless cosmetic and optical condition with one very minor functional caveat – the lubricant for the slit adjustment is just a bit tacky, so there is a bit of delay when the slit is opened after being closed, but it reacts within a very few seconds. The camera housing main cylinder has a very tiny scratch in the finish (visible in one of the photos). The only serious issue regarding condition is that of the cabinet. It definitely shows some shelf wear and the black cloth covering is lifting and or worn in several places. Most oddly, the upper half of the clasp assembly appears never to have been pinned into place! There are no holes in the cloth where the pins would have been, nor are there any compression marks on the chrome plate. All this to say that the lid will not stay closed – the clasp remains fixed to the bottom of the case as the lid is lifted. Obviously all that is needed are three tiny brads of appropriate dimension, but I do not have them. The interior of the cabinet is in much nicer condition than the exterior. Please see the photos for condition of the case. Descriptive notes – unless otherwise stated in the above description, all microscope components have been checked for proper operation. If there are any problems they will be noted above under one (or more) of the following categories. Optical condition: Blemishes in coatings, scratches, delaminations, fungus, or haziness. Cosmetic condition: Notable problems in surface finishes badly worn paint, names engraved in paint, etc. Mechanical condition: Problems with mechanical functions, such as broken components or parts in need of lubrication. Electrical condition: The item is checked for proper function of electronics when appropriate. If unable to test due to incomplete nature of the offering, this is also noted. Instrument should be packed similarly to the way it was received. Item must be in the same physical condition as when it left our premises. We pack instruments very well, and have never had a damage claim (though rare) denied by any carrier. We do not use UPS. Trying to do so results in the inability to fully insure the parcel. Occasionally, emails do go astray – if you do not hear from us, do not panic! We will do our best to contact you! We do not accept credit cards! This is the furthest zone in the CONUS from our location. However, on even moderately heavy parcels the differential can become very substantial. On rare occasions when something requires elaborate packing and materials, I will stipulate so within the body of the item description (usually for very heavy and delicate items). All funds must be in US currency. The item “Atago Vintage (c. 1960) Cased Spectrometer / Camera System, Unused” is in sale since Friday, March 03, 2017. This item is in the category “Business & Industrial\Healthcare, Lab & Life Science\Lab Equipment\Other Lab Equipment”. The seller is “dawsonmic” and is located in Stow, Massachusetts. This item can be shipped to United States.